Parables are a gentle way of teaching. Even Jesus used them as way to teach His followers without pointing fingers, because each story is presented in a way that calls us to see ourselves mirrored in the tale. 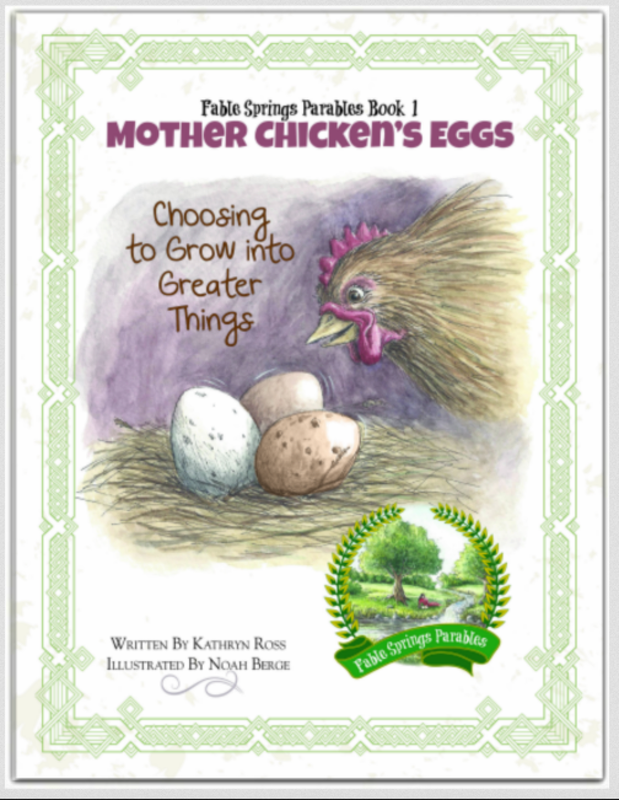 The Fable Springs Parables from Pageant Wagon Publishing are no different. 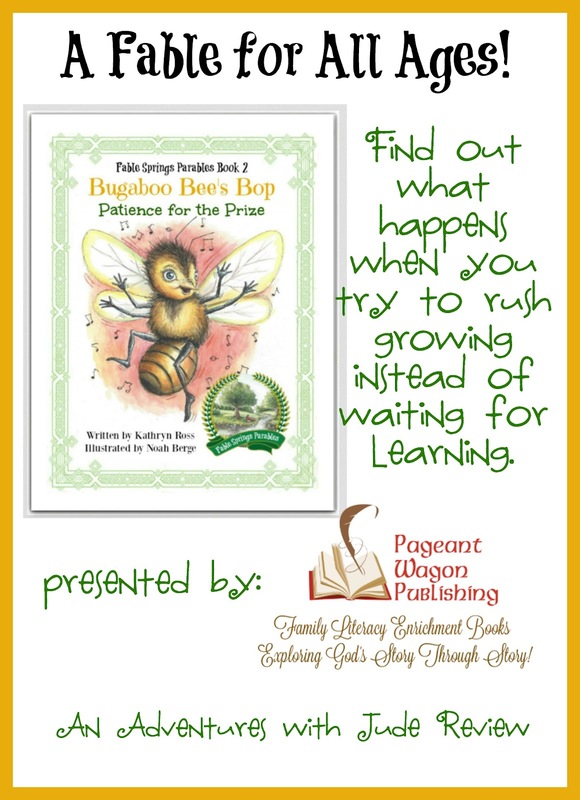 In their second book, Bugaboo Bee's Bop: Patience for the Prize, we are invited into a beehive to see what happens when we try to rush growth. I first learned about Pageant Wagon Publishing when I met author Kathryn Ross at a local Harvest Festival in late 2015. We were assigned vendor spaces next to each other, and she was promoting the first book in this series, Mother Chicken's Egg: Choosing to Grow Into Greater Things. I knew I needed to purchase a copy before we closed up shop for the day. In the story, one of Mother Chicken's eggs won't hatch out of his shell; he's decided he likes the comfort zone his shell provides, and thinks he will just stay there, thank you very much. Doesn't that sound very much like a titular little boy we know? This book, written by Kathryn Ross and illustrated by Noah Berge, balance provocative thought with gentle illustrations that are reminiscent of Beatrix Potter's ink and watercolor sketches. When we heard that there was a second book coming soon, we couldn't wait. 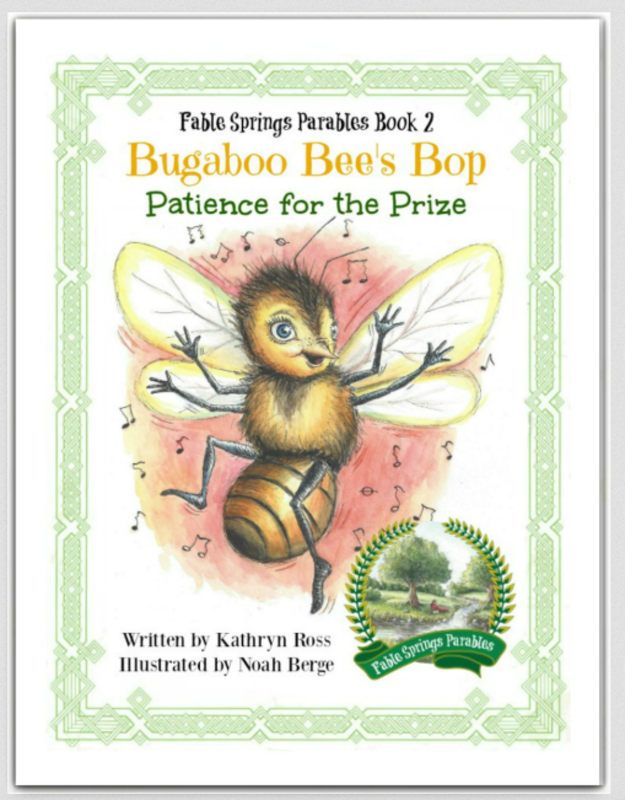 Bugaboo Bee's Bop: Patience for the Prize brings us the story of Bugaboo Bee, a young "NewBee" who wants to race to the top. In her hive, there is a natural order to growing: NewBees take care of the baby bees, and then they work their way up to being members of the Drone Bee Band, directing bees in and around the hive. Bugaboo wants to be a bandmember now, and generally whines and complains the whole time. She even plots how she's going to sneak into the band. What could go wrong? Well...everything! 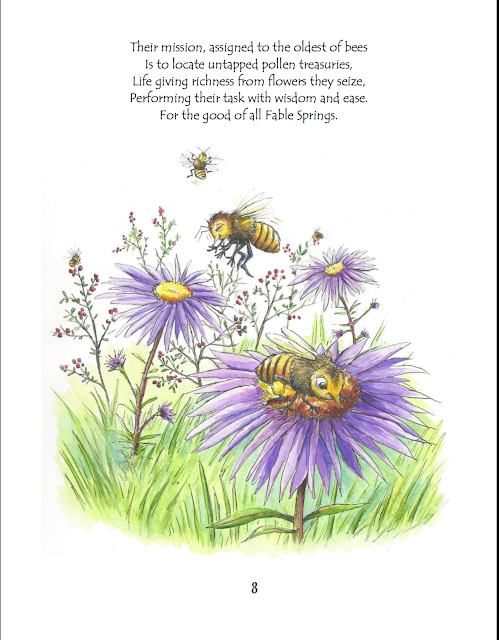 The bees get confused and begin to swarm, the queen flies from the hive, and it takes the Fable Springs Beekeeper's help to restore order. A chastened and contrite Bugaboo realizes that she was wrong for trying to rush things. She learns that you can't go from NewBee to Dancer without learning all the other things a bee must know first. I've made it no secret that St. Francis deSales is one of my favorite saints. When a book begins by quoting from An Introduction to a Devout Life on its title page, I can't help but love it. The firm yet gentle parable story will give you the tools to embody another Salesian wisdom: "When you encounter difficulties and contradictions, do not try to break them, but bend them with gentleness and time." The story never becomes preachy, or takes on any pointedness. Rather, it showing the cause-and-effect interplay between what Bugaboo Bee wants, what she should do, and what she wants in a very matter-of-fact way, allowing the reader to come to the conclusion of what the right way to behave is on his own. 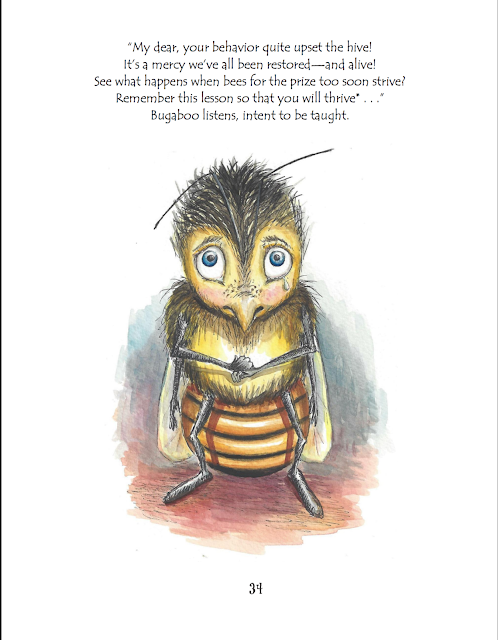 Here, Bugaboo Bee is shown choosing to listen. We still hear the queen's admonition, but it's through a choice that Bugaboo Bee changes her heart and allows it to be taught, rather than being lectured into submission. I'm sure many adults can identify with the difference between knowing what you need to do to accomplish a goal and being ready to make that change. The story unfolds in a lovely rhyme pattern. The cadence and rhyme never feels forced, and it is easy to read this book aloud without feeling the words are racing ahead of you. I usually don't take notice of font styles in books, but I have to comment on the font here, because it shows the attention to detail that Pageant Wagon Publishing puts into their books. The font feels fluid yet staccato; zipping up, down, and across the page like a bumble bee. The stanzas are well matched on the page with the illustrations as well. In addition to the softcover or hardcover copies of the book, a Companion Audio Book CD featuring Fable Springs Parables author and storyteller, Kathryn Ross, performing each story in a full dramatization. Miss Kathy reads the story in a clear, plummy dialect that easily slides into character voicing: a regal and haughty queen bee, a petulant and later contrite NewBee. There is never any doubt to who is speaking in the story. Traditional Irish fiddling, provided by 6 time All Ireland Fiddle Champion/2015 Fiddler of Dooney Champion Haley Richardson, provides a soundtrack that enhances the story; the lively fiddling is reminiscent of a bee's signature buzzying sounds. While this is a beautiful stand-alone picture book that will gently build your child's character, a PDF Unit Study is available if you wish to use this book as a literature study or as a devotional study for older children and/or adults. The story is written in a way that while it is recommended for children and adults ages six and up, it could be given as a gift to a preschooler and read as a simple picture book, and then revisited by older children and adults as they grow. Bugaboo Bee's Bop: Patience for the Prize is a simple story with simple illustrations, yet provides a complex message to its reader. It is a delight to read, and provides thought on many levels for many ages. I foresee many Pageant Wagon Publishing books being well-loved in our home!